Lunchtime on a Saturday isn’t always a thing. Often overshadowed by the expectations of weekend brunch, lunch usually doesn’t get its just do. But, on Saturday, August 19th that wasn’t the case, as foodie fans and booze lovers made their way to The Brixton at Shops at Legacy and took part in an afternoon of splendor with celebrity Chef Tiffany Derry. Chef Tiffany Derry discussing techniques and ingredients. 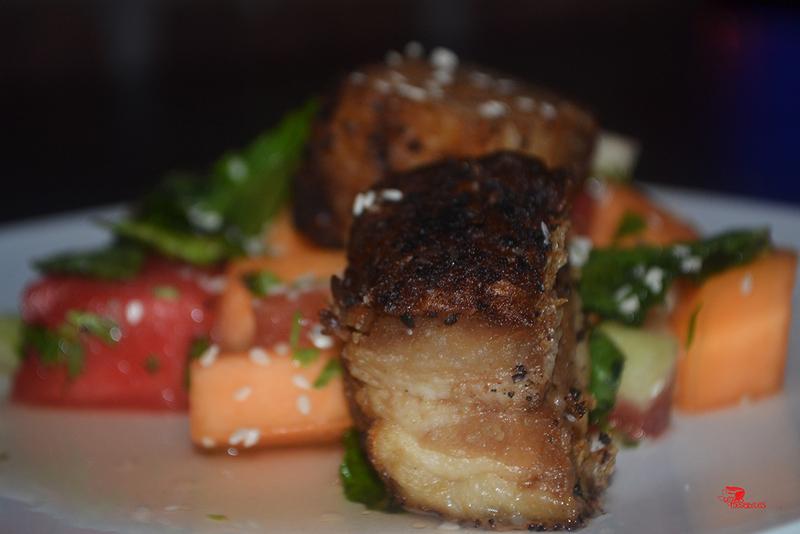 Pork belly with watermelon salad. 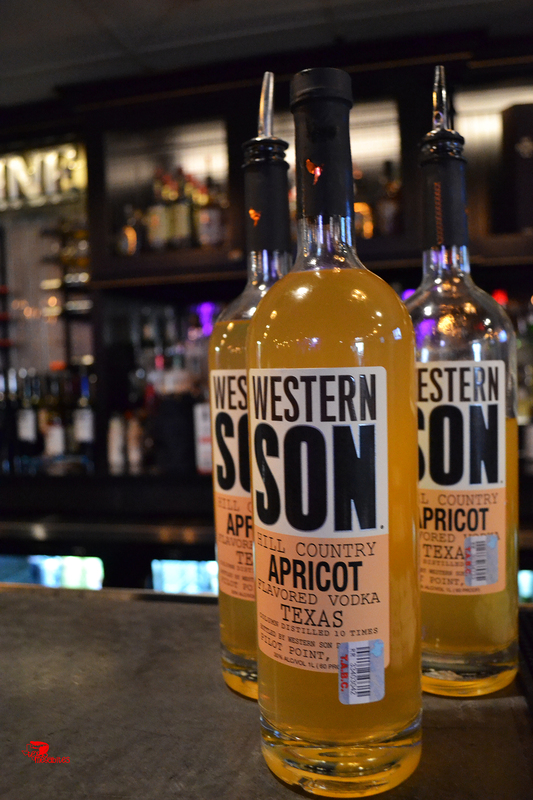 Western Son’s Apricot Vodka. Sadly, it will soon be discontinued. Strutting out to Jill Scott’s Golden, Chef Derry took to the stage to prepare three of her favorite dishes. 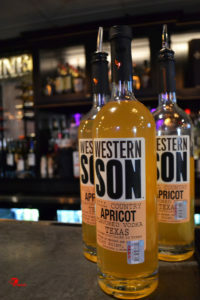 Each dish was paired with a cocktail made with vodka or whiskey from Texas’ own Western Son Distillery. 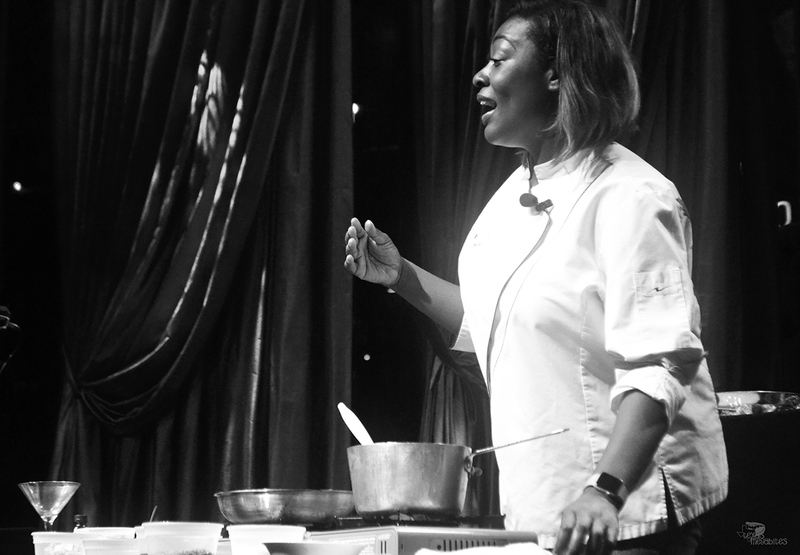 While showing off her cooking techniques, Derry enthusiastically answered questions from the crowd on everything from different types of cooking oil to updates on her upcoming soul food style restaurant, Roots. For the first course, simmered tender pork belly was tossed in a pork salad dressing made with champagne vinegar, basil, mint, cilantro, olive oil and a little fish sauce. During the preparation of the pork belly, Derry gleefully commented to the audience, “Recipes are just guidelines, you don’t have to make them exact. Remember to use what you have.” Once fully seared it was served atop a mixture of watermelon, cantaloupe, baby arugula, basil and mint then finished with vinaigrette and sesame seeds. The combination of salty, from the fish sauce cascaded into the sweetness of the melons to create a sa. Served with a Rock N Mules, aka a Moscow Mule, the tenderness from the pork belly and lime and ginger from the mule mingled happily together. Tender beef short ribs with mashed potatoes and a tast kimchi vegetable medley. 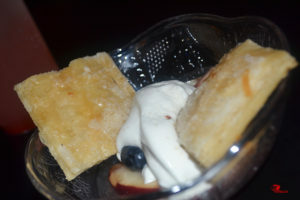 Tiffany’s finale of peaches and cream was served with the Foxy Lady made with Western Son’s Apricot Vodka. 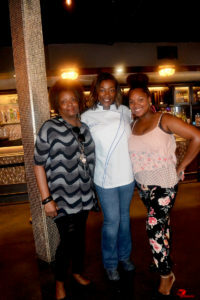 Chef Tiffany, and momma and me. To top off the tators and short rib, Derry prepared a mouthwatering kimchi vegetable medley. Made by her grandmother, the kimchi uses whole fermented Napa cabbage. 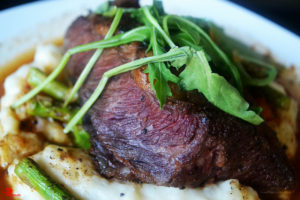 Next, she added a mix of pencil asparagus, tomatoes and garlic, giving you just the right amount of crunch over the short ribs and mashed potatoes. This dish was served with the Live and Let Rye cocktail, made with Red River Rye, Black Walnut and Aztec Chocolate Bitters. The whiskey forward drink simply leaned into the beef, potatoes and kimchi giving your taste buds the relationship it didn’t know it was searching for.